The famous race events on the Cam are "The bumps". The rules are simple. There are about 17 boats in each division and they all start at the same time spaced about 1.5 boat length ahead from each other. The objective is then to chase the boat in front of you until you hit it and avoid getting hit by the boat behind you. 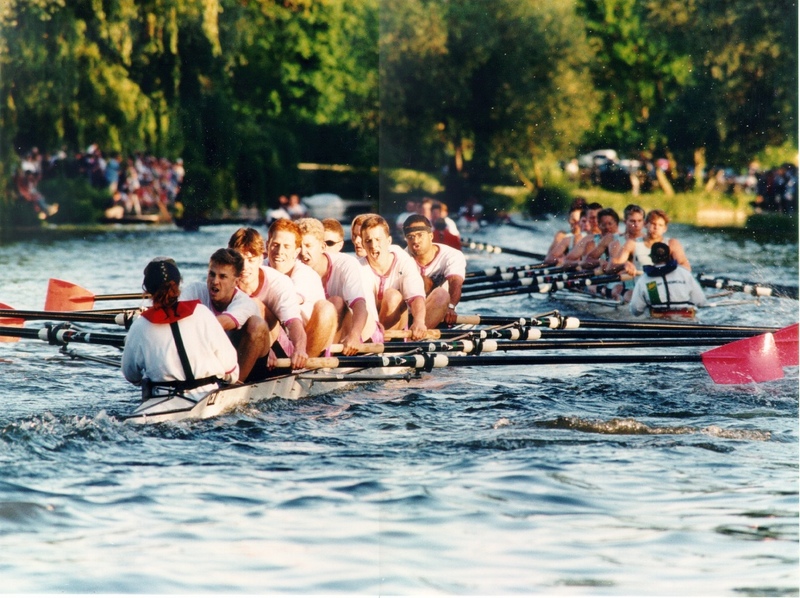 The picture to the left is from the University May bumps in 1996. I was in Churchill college 1st VIII and we were chasing Caius 1st VIII. After a massive sprint we missed hitting them by a foot and although they slipped away coming out of Plough Reach I still recall this as one of the best races I've had with that crew. The summer 1996 was the time of my life as a rower. I rowed in Churchill College's 1st VIII that beat Imperial College B in the Temple Challenge Cup at Henley Royal as you can see on the left picture. 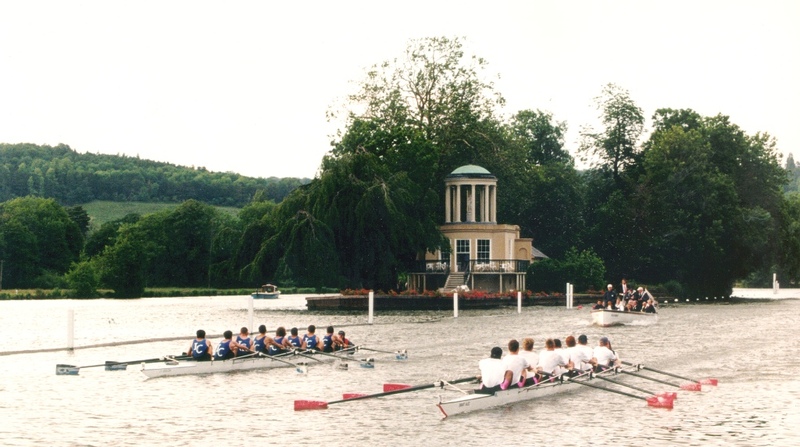 The regatta that takes place every year at Henley-on-Thames is one of the traditional English social events happening every year. Read my personal account of the race here. The ultimate way of rowing is to scull I think. However it is slower than in an VIII. But because there is no doubt about who is spannering in the boat you have instant feedback about what makes the boat go faster. If it goes well and you can feel the rhythm then it's because of you, which is a most rewarding experience. The downside is when it is crap and there is no one else to blame. Bumps races with sculls ought to be held one day, I think! Go here for my sculling page. Rob Roy Boat Club, the premier centre of excellence, second to none within the wider Cambridge rowing community.